If you’re excited about listing your products and selling through Etsy, go ahead and try out our ExportFeed app right now. ExportFeed will prepare the product info of your BigCommerce store within a few minutes of installation. You can add Etsy and other multiple sales channels to promote your sales including Google Shopping, Amazon, eBay, Facebook, ShareASale, etc. Avoids unnecessarily adding multiple apps to integrate your BigCommerce products to multiple sales channels. As you need to define which products of your BigCommerce falls under which category while listing BigCommerce products on Etsy, this is made hassle-free by ExportFeed app. One feature that you’ll definitely love is the ability to modify your product data in bulk and map those with the product attributes required by Etsy. 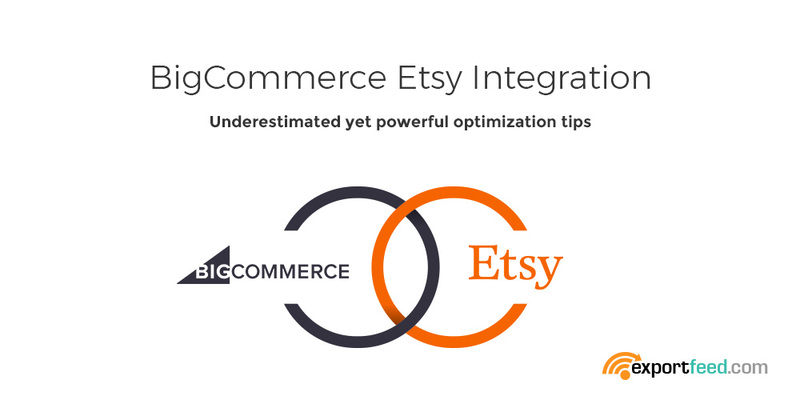 Now the optimization tips on BigCommerce Etsy Listings! Tags provide a better identity for your products. But a more important role of tags on Etsy is to allow the buyers to find your products in the search results. Etsy allows up to 13 tags per individual products. With appropriate use of even up to 10 tags per individual products, you can over almost any useful variation of the product keyword with purchase intent. ExportFeed will add the tag values for your products on Etsy by extracting them from slug and product title. Images are always able to grab the user attention more than any product attribute. Not just getting the first click but the use of proper images also helps to boost conversion. Multiple clear images representing the products will allow viewers to get a better idea of the product. You can add multiple images to your BigCommerce shop, but what about Etsy? Etsy also allows you to upload up to 9 images of your products. While using ExportFeed to list your products to Etsy, you’ll be able to upload all 9 to add to the conversion value for your products. Any hidden costs including the shipping is a major setback for the growth of your business and create trust issues. If it is possible to offer free shipping, this is highly recommended. What if you are not able to offer free shipping? Make sure that you create a flat rate shipping profile on your Etsy seller account. In order to list bulk products on Etsy, you’ll need a flat shipping profile. Uploading bulk products through API connection is only allowed for products with flat shipping profiles. If you too underestimated these optimizations, you need to take action now. And if you haven’t yet started selling on Etsy, start adding the profitable sales channel using ExportFeed BigCommerce App.